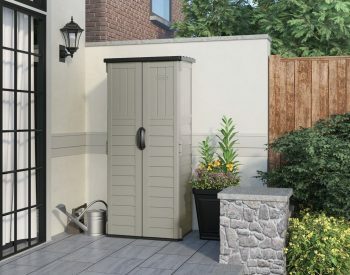 Are you looking for a large storage unit suitable for several bikes or 3 wheelie bins? 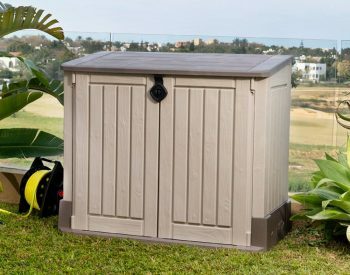 The Keter Grande Store is a state-of-the-art storage solution that combines rustic style and durability. 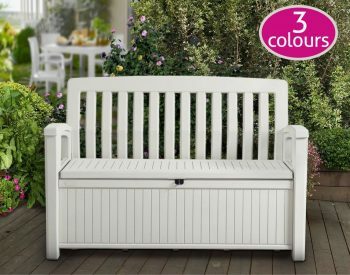 Its huge size, the biggest of its type in the Keter range, make it the obvious choice when you need extra space. 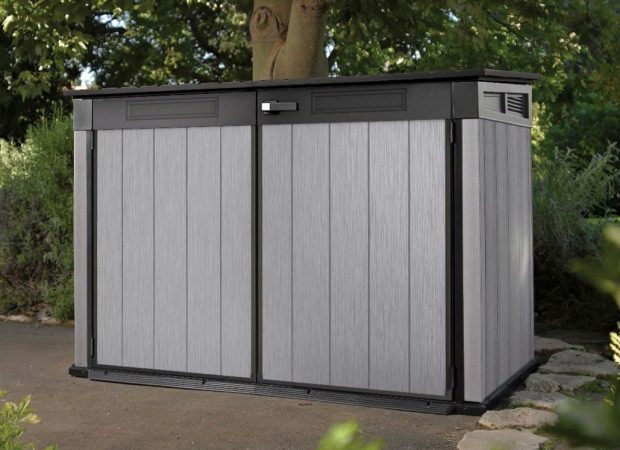 Made with ultra-rugged DUOTECH™ walls, it will withstand any weather conditions and will maintain its appearance intact without requiring maintenance. The walls are also paintable, so you can customise the unit match your home and backyard. 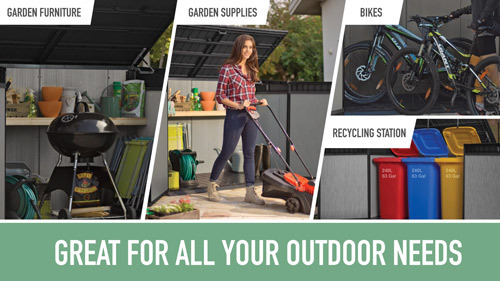 This shed offers the perfect storage solution for three 240L wheelie bins, two adult and two children’s bikes, or gardening tools. Check the internal and external dimensions we have listed below. 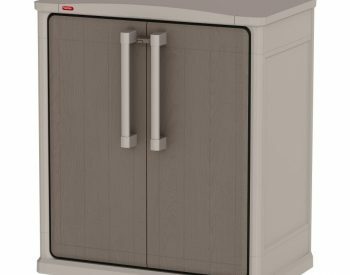 This storage unit also comes with a sloping threshold, locking system, built-in ventilation and adjustable brackets to install an extra shelf. Made of durable and hardwearing resin, and with rib-reinforced wall panels and steel reinforcement for greater strength and rigidity, it is virtually weather-proof and fade-free. Lid-to-lid chains for hands free bin opening, with a bag in each hand you can open and deposit your rubbish easily! KETER GRANDE STOREThe delivery was only 4 days from order to door in rural Victoria which I found good. The shed was easily assembled and seems very strong. This is the second Keter shed that we have purchased the first 7yrs ago served us very well as a small wood shed outside our back door, but our daughters dog pulled the end off and chewed it up. This shed will be filled with wood on Friday so we will see if it serves as well as our last. 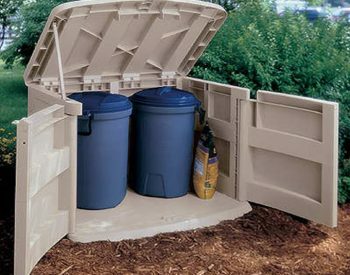 Looks and works great!Super roomy, sturdy, and rainproof. 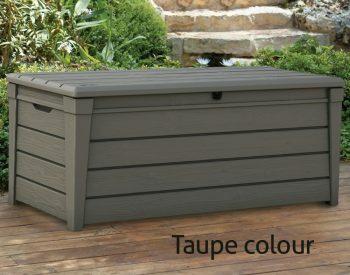 We store all our garden cushions in this, even the long ones for our outdoor couch, and have room to spare! Perfect fit.Very happy with our new mini shed. Perfect for the space we had available yet plenty of room for storing all our outdoor cushions and umbrellas etc. Functional and attractiveThe storage is functional and looks good providing ample room for 2 bikes and a lot of other sports and outside gear. Stays dry and fresh. Assembly was ok albeit brief instructions. One tip is that some screws are required around the base at the end, which can be difficult if in position and hard to access. However the finished product works well and looks good. Good Mini ShedVery easy instructions to follow. Looks good and is hopefully going to be durable. Waterproof. Easily fits 4 bikes, kids scooters and a few extra things. Helped to have an occasional second pair of hands when assembling the lid and moving into position. It is quite heavy and solid when assembled. KenDelivery was prompt and the shed was easy to assemble and looks fantastic. Keter Grande StorePurchased the Grande Store to facilitate storage for my mower/garden equipment etc. From purchase to delivery, the time frame and communication was excellent. The delivery driver called on the day of the delivery with an ETA and was spot on. The shed itself was a cinch to put together. Each part is numbered/identified. The instructions are clear, concise and easy to follow. Very happy with the purchase and will be buying further products. Keter GrandeGood instructions, easy to assemble. Looks great and is very sturdy. Easy to open, and plenty of space for bikes and kit. 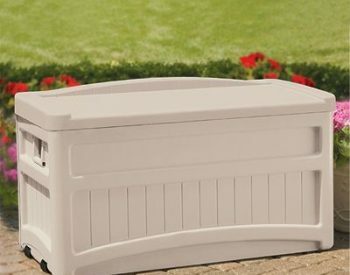 Keter Grande StorageLooks fabulous in the garden Fits bins perfectly. 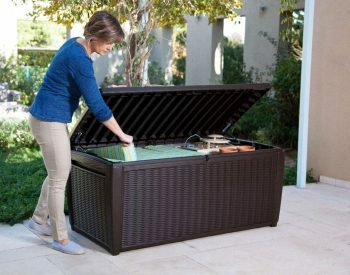 Ordering another one for the backyard to store the kids bikes and scooters! Good quality storage unit. It fits my three wheelie bins. Took 2 people about 2 hours to assemble. Looks great in the garden. KETER GRANDE STOREBrilliant product. Not hard to assemble. Looks good and works well. Easily fits my 3 bins. 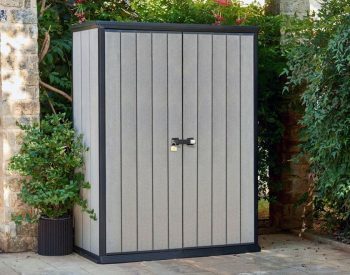 Fantastic purchase - met all my expectations & requirements!Purchased this shed for bike storage - very happy with it! Quite sturdy with the metal frame although main components are plastic. Easy enough to install, however allow several hours! Only criticism is the assembly instructions - not always easy to decipher steps from pictures alone, step-by-step written instructions would have fast-tracked the job, but got there in the end! Quite pleasant to look at too! Would thoroughly recommend to anyone requiring storage for a confined area! KETER GRANDE STOREWe love our new Grande Store. 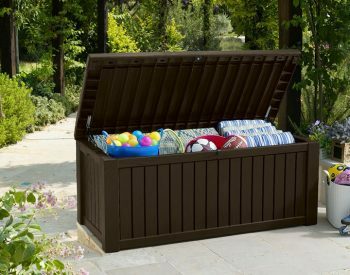 Very easy to put together .. looks very nice ... parts fit together perfectly to make an amazing lockable storage. 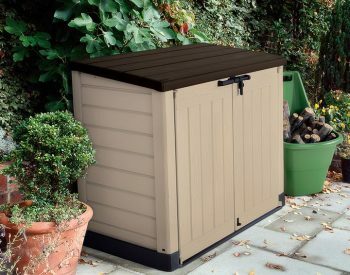 Great Little ShedFantastic product, fast delivery, great company to deal with. Great shed with heaps of room. Very easy to assemble. Highly recommend. Love itSo easy to assemble, looks amazing and isn't going to rust!! L LowReceived delivery within a couple of days. Was easy to assemble, took me about 3 hours with my 12 year old son, use of an Electric screwdriver helped with the build. Was able to store 3 bicycles with probably at least space for another. Highly recommend. We are very happy with our purchase. It was easy to assemble and the opening mechanism works very well. Great shedWas put together quite easily by my husband and father. It’s sturdy and looks good. We can fit two children’s bikes and two adults bikes in it. Only issue was the delivery company did not contact us prior to delivery so was lucky somone happened to be home the day they delivered. Was easy to order and arrived very quickly. Good sturdy product and meets my current needs. 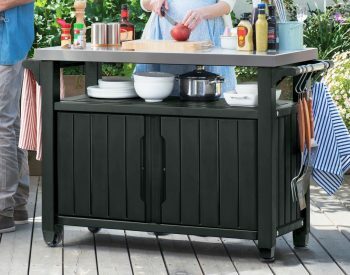 It can be put together by one person, however, two makes it much easier. You will need to dedicate 2-3 hours to put the shed together. Once assembled it should look great in your yard. Fantastic product. Exactly a described and was perfect for our needs. I managed to put the store together on my own. Very well made and strong. Impressed with the quality of this product. Quick dispatch and arrived in good condition. Great product. I am very happy with this shed. It stores 2 adult bikes with some room to spare. Happy with product and assembly instructions, took a while to come, not the 5 days as expected. Landera note: Delivery to WA does take longer than the eastern side of the country sorry. Great product! Exactly as described. Loads of space inside. Instructions were easy to follow and the box went together perfectly. Definitely need an electric screwdriver to speed up the construction.